We have created a standard range of C6 Wallet Tools that can be branded single colour silk screen or digital print multi colour. Carbon fibre is a super strong material that’s also extremely lightweight. Engineers and designers love it because it’s five times as strong as steel, two times as stiff, and yet weighs about two-thirds less. For these reasons, tech freaks and gadget lovers covet carbon fibre for its almost mystical qualities and classy matt black woven looks. 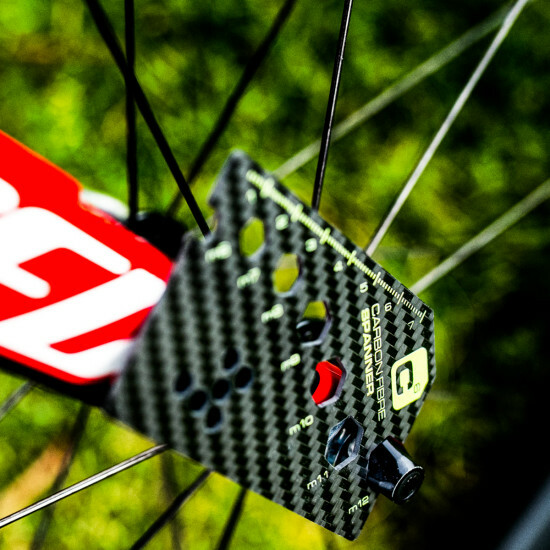 So why aren’t more products made of carbon fibre? The simple answer is because it is very expensive to produce. An elite club such as Formula 1 constructors and aerospace manufacturers take advantage of this amazing material. But there is a “trickle down” effect in the technology to road bikes and other consumer markets. C6 Wallet Tools are machined from sheet carbon fibre so you get all the structural benefits of this material combined with stunning looks. 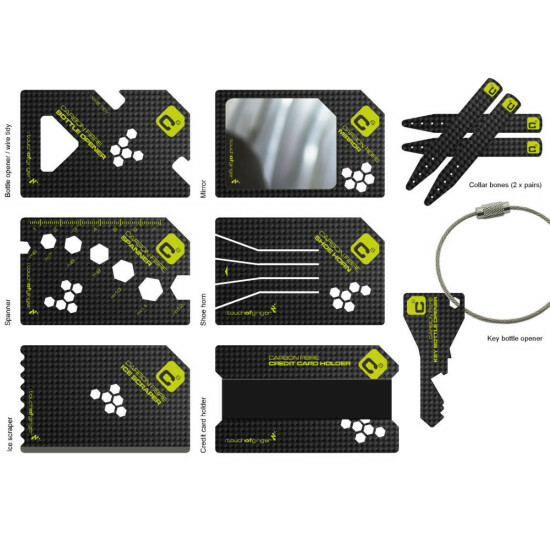 We have created a standard range of C6 Wallet Tools that can be branded single colour silk screen or digital print multi colour. 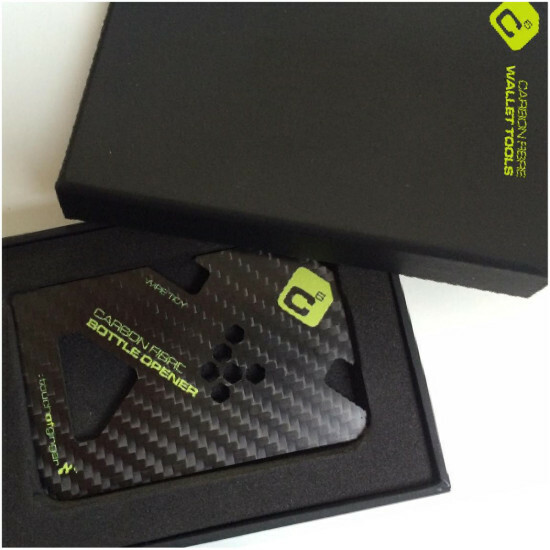 Those in the know and who appreciate carbon fibre love the look and feel of this product, and it’s a perfect gift for any technology company wishing to communicate that they are on the cutting edge. That they weigh so little is a bonus; you’d hardly know if a C6 tool was in your wallet. When we developed the product we knew it was a winner, so it was nice that it received recognition from the promotional gift industry. In addition to the credit card sized tools, we also offer stylish carbon fibre collar bones to keep your shirt collars looking sharp. 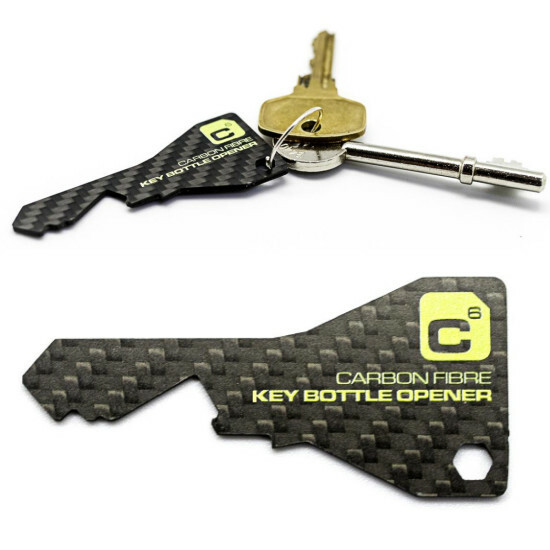 And a witty keyring shaped as a door key that doubles as a bottle opener demonstrates the versatility of the material. Innovation and creativity are strong brand messages for many corporations, this product makes a great corporate gift that is genuinely useful, cool and won’t break the bank. You can’t quite believe something so light can be so strong! We like the contradiction and the spanner is a great example of the amazing characteristics of carbon fibre.